The timing of the new tensions in Donbass, provoked by the Kiev forces, is connected with the upcoming EU summit, Kremlin spokesman Dmitry Peskov said. He added that Kiev has breached the Minsk deal and Moscow is waiting for the OSCE’s reaction. "The violations are obvious and [Foreign] Minister [Sergey] Lavrov has already said that the representatives of the OSCE are to draw corresponding conclusions and to clearly identify who is responsible for these violations [in eastern Ukraine],” Kremlin spokesman Dmitry Peskov told journalists Thursday. According to Peskov, the Kiev authorities are responsible for the recent escalation of the crisis in the troubled region. “Donbass is being shelled. Self-defence forces can’t shell their own territory,” he said. Peskov said that the attempts to destabilize the situation and provoke the tensions can be clearly seen. “These provocative actions are organized by Ukraine’s military forces and we are concerned with that,” the Kremlin spokesman added. Moscow believes that the timing of the new tensions is connected with the upcoming EU summit, which is to take place in Brussels on June 25-26. "Yes, indeed, in the past Kiev had already heated up tensions amid some large international events. This is the case, and now we are seriously concerned about the next repetition of such activity,” Peskov said. At the summit, the European Union is looking to extend its broad economic sanctions against Moscow over Ukraine crisis until January 2016, according to several senior officials and diplomats, the Wall Street Journal reported. Apart from the EU summit, there will also be a G7 summit on June 7-8 hosted by Germany at the Elmau castle near Garmisch-Partenkirchen, in Bavaria. In 2014, the G7 leaders refused to participate in the G8 summit in Sochi after Crimea reunited with Russia last year following a referendum that was consistent with international law and the UN Charter. In April, German Foreign Minister Frank-Walter Steinmeier said that G7 leaders are not yet ready to welcome Russia back at the discussion table. Eduard Basurin, spokesman for the Donetsk People’s Republic (DNR) Defense Ministry, said that the special OSCE mission is planning to visit those injured in Wednesday’s shelling in the city of Donetsk. Kiev forces shelled the eastern Ukrainian city on Wednesday, mostly the southwest Petrovsky and Kirovsky districts, killing at least six people and injuring 90 others. The bombardment also caused a great deal of destruction at the city’s Sokol market, where several rows of shops were burned down. The RT crew, who were among the first reporters at the scene, recorded dramatic footage of the shelling’s aftermath. “According to preliminary information, Ukrainian troops opened artillery fire from a 152 mm gun. It is probably a 2A36 Giatsint-B [field] gun,” he added. However, US State Department spokesperson Marie Harf refused to directly acknowledge that the Kiev authorities are violating the Minsk peace agreements, turning a blind eye to daily OSCE reports that equally implicate the government and the rebel forces. Harf insisted Wednesday that the “majority of violations” have been committed by rebel forces and not Kiev’s troops. “Everything we’re getting from the OSCE and other sources of information indicates that a vast majority, as my colleague said, are from the Russian-separatist combined forces,” Harf said in reply to a question from RT’s Gayane Chichakyan. The Minsk-2 peace agreement was struck in February 2015 by Kiev and the eastern rebels and brokered by Russia, Germany and France in the Belarusian capital of Minsk. It provided for the steps intended to bring peace to war-torn eastern Ukraine, including a ceasefire, the withdrawal of heavy weapons from the frontline and constitutional reform decentralizing power. The current escalation of violence led to an increase in fighting, which saw over 6,000 killed since April 2014. On Wednesday, the General Staff of Ukraine said that Kiev’s forces were using heavy artillery that had previously been withdrawn from the frontline under February’s Minsk peace deal. 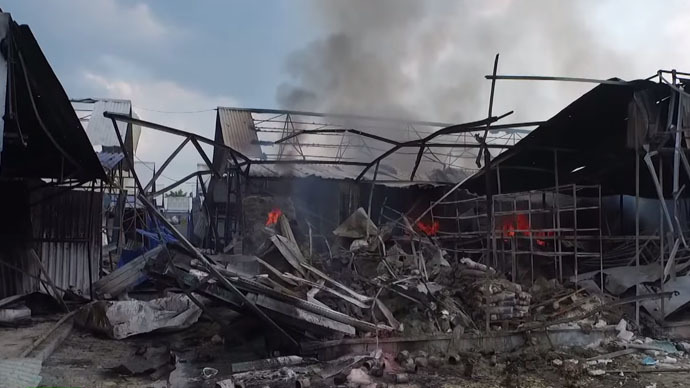 “In order to stop the enemy’s offensive and to avoid casualties among the troops, the Ukrainian military command – after warning all of its international partners – was forced to use artillery, which was in the rear areas defined by the Minsk agreements,” the General Staff’s press service said, as cited by RIA Novosti news agency.